There was a feeling of buzzing excitement in a 6th floor room today, where tensions ran high, and students’ chatter and adrenaline filled the room. 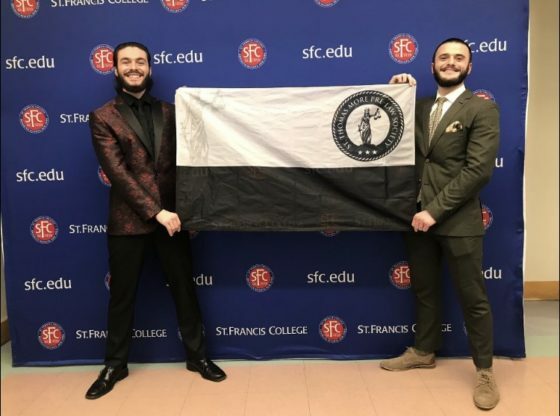 The St. Thomas More Pre-Law Society flag hung at the front of the room, presiding over this highly anticipated convention, where the nominees for next year’s Executive Board were officially granted candidacy. It was the most appropriate place for the flag: hanging above the heads of each candidate, as they stepped up to address the members with their vision for the Pre-Law Society’s future, as the elected leaders will indeed be serving under this flag and what it symbolizes: the dedication to law, and the members who have joined in pursuit of that dedication. The Society’s current President, Nicholas Vitrano, stood at the front of the room, called for everyone’s undivided attention, and extended a warm welcome to the members, before announcing that the nominations were officially underway. There are six Executive positions being sought after, three of which are competitive, with more than one candidate vying for a seat. The candidates for the remaining three positions are running unopposed, all but assuring a victory. Nonetheless, the unopposed candidates still presented their platform to members, who can rest assured that they will have well-qualified and well-intentioned leaders in these positions. Alex Terepka, the sole candidate for Interior Secretary, stressed his dedication towards extending the feeling of family the society gives off to its members, while Kelvin Nolasco, the incumbent Treasury Secretary running unchallenged for his seat, plans to continue his work in securing merchandise & apparel for members, while also beginning to form fundraising committees & organizing charitable events. The last position that’s unchallenged is the distinguished Vice Presidency, and Stefano Forte is the charismatic candidate for the position. He’s already an established leader within the Society, as the current Interior Secretary, and is seeking to serve at a higher level. In his speech for the nomination, he emphasized a “membership-first” Society, where members have a say in the future direction of the organization. When asked what qualifies him to be Vice President, Forte highlighted his time spent listening to members’ thoughts & concerns and being attentive to them, as Interior Secretary. “Listening to the people that you’re going to be leading,” he said confidently, is what qualifies someone to hold a leadership position. Forte has also openly endorsed the Presidential incumbent, Nicholas Vitrano for re-election, and the two are essentially running on the same ticket, both urging members to “Vote Vitrano & Forte” at the end of their speeches. With that being said, all eyes are on the Presidency in this years round of elections, as incumbent, President Nicholas Vitrano, faces challenger, Frank Filocomo. Vitrano has presided over the Society as President for the past year, and the organization has greatly flourished under his leadership. It has grown in membership substantially, and has begun to build professional networks outside of the school, namely with the law firm Vitrano and two other members work at, who will actively be looking within the society when there are openings for students. Moreover, if re-elected, President Vitrano has big plans for the Society’s future, starting with securing LSAT Prep for members, and possibly launching a Symposium where Pre-Law students conduct research on a topic of their choice, that must be rooted in law, alongside their professors, and report their findings at an organized conference. And while President Vitrano is very popular among members, he faces a strong opponent that is Frank Filocomo, who mustn’t be underestimated. Filocomo is the current Chairman of the Mock Trial Committee, and he, alongside the Chairwoman of the Committee, has transformed the committee into a great, active, and intellectually stimulating sector of the Society that engages in the practice of law. Filocomo is pushing a “Law First” agenda, where he emphasized our locational advantage, in “the epicenter of law and courtrooms,” and will seek access to the courtrooms, particularly for Mock Trial. His platform also includes focusing on the LSATs and Mock Trial, while straying away from political issues, as this is not a political club. “I want to take the society in a more law-oriented direction,” he says, and this agenda clearly lives up to that. The battle for the Presidency will undoubtedly be hard fought between President Vitrano and challenger, Frank Filocomo. Vitrano is well liked among members and, as the incumbent, has his supporter base to tap into once again. Yet, Filocomo will be a force to be reckoned with, as his law-oriented agenda is enticing for members, and his passion is palpable, and clearly runs deep. The remaining two competitive positions are the races for Secretary of Society and SACOR (Student Assembly Core of Representatives) Secretary. Rachelle Mejia, the Top Advisor to the current Secretary of Society, Natalia LaMorta, and Gabby Smalls, the Chair of the Pre-Law Journal, will run against one another for the title of Secretary of Society. Ryan Elkassem, the Chair of the Discussion & Debate Committee, and Rebeca Oliveira will face off for the position of SACOR Secretary.